The formal ceremony, during which the Army of Northern Virginia gave up their arms and colors, took place on April 12, 1865, three days after Lee met with Grant in McLean House. Mr. History Tourist and I were going to drive home early on the morning of the 12th, but one of the reenactors convinced us to stay until 3 pm, for the final stacking of arms ceremony. 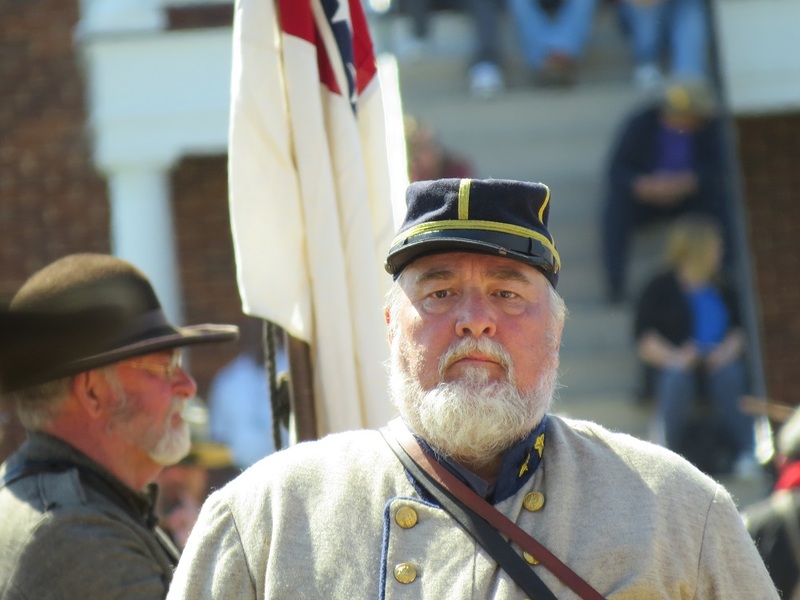 He said that annual reenactments bring overwhelming emotions to the reenactors, so he imagined that the 150th anniversary reenactment would be all that more poignant. He was right. 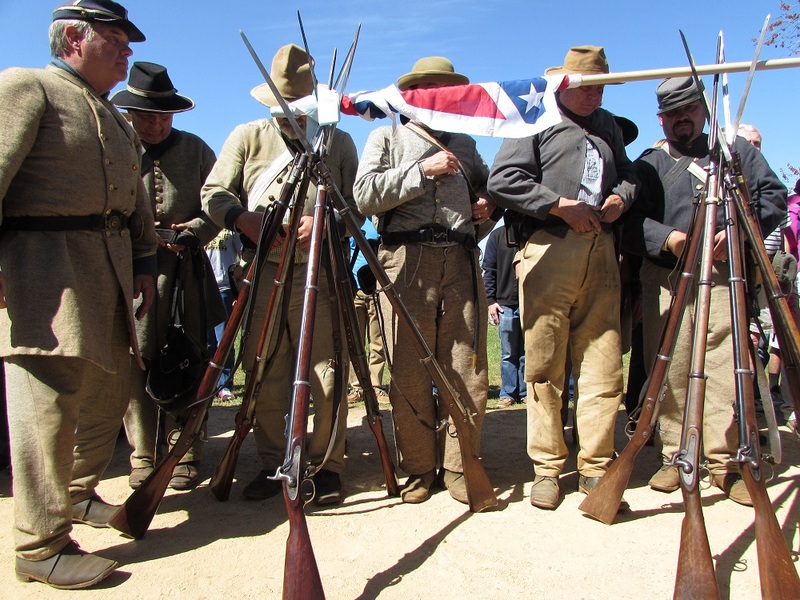 Many of the Confederate reenactors (and some of the audience) were in tears by the end of the ceremony. 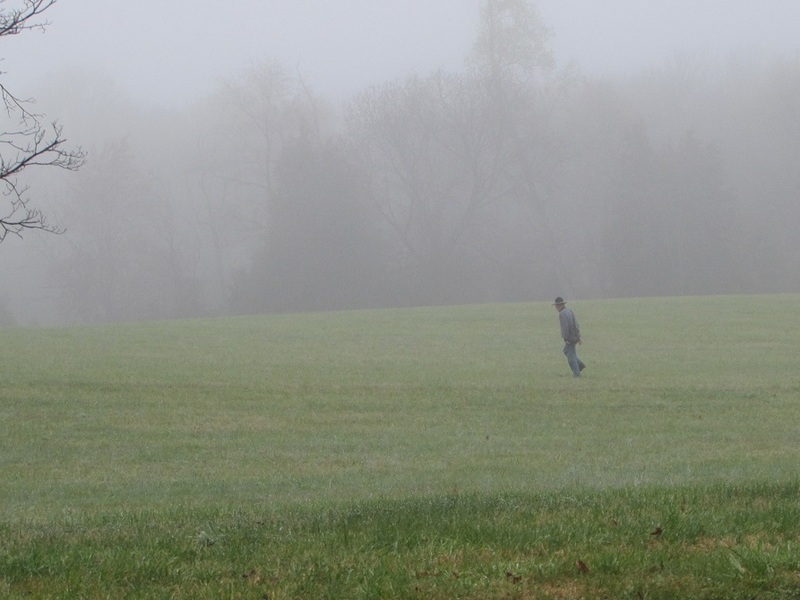 A blog post with just a description and without that emotion just didn’t seem right. But I’m not a professional writer and I didn’t want to fall into cliched traps. Then I remembered one of the best Civil War writers around: Joshua Lawrence Chamberlain. Famous for a leading his regiment in a bayonet charge down Little Round Top at Gettysburg, he was, at the conclusion of the war, put in charge of the laying-down-of-arms ceremony at Appomattox. And he wrote beautifully and poignantly about it. So I decided to leave the words to General Chamberlain. I have used excerpts from a version published in the Boston Journal in May 1901, found on the website of the Civil War Trust. I have left out the paragraph describing the famous “bowing horse and general” incident out (those of you who are unfamiliar with it should read the entire, not-too-long account on the trust site because it is thrilling) because, sadly, it was not part of the reenactment. “I was also told that General Grant had decided to have a formal ceremony with a parade at the time of laying down of arms. 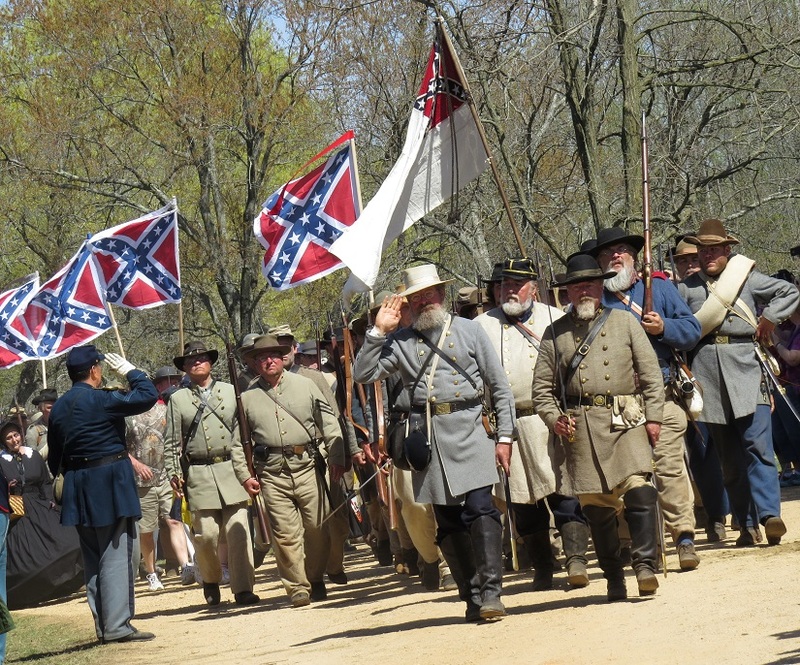 A representative body of Union troops was to be drawn up in battle array at Appomattox Courthouse, and past this Northern delegation were to march the entire Confederate Army, both officers and men, with their arms and colors, exactly as in actual service, and to lay down these arms and colors, as well as whatever other property belonged to the Rebel army, before our men. “I was told, furthermore, that General Grant had appointed me to take charge of this parade and to receive the formal surrender of the guns and flags. Pursuant to these orders, I drew up my brigade at the courthouse along the highway leading to Lynchburg. This was very early on the morning of the 12th of April. “Having thus formed, the brigades standing at ‘order arms,’ the head of the Confederate column, General Gordon in command, and the old ‘Stonewall’ Jackson Brigade leading, started down into the valley which lay between us, and approached our lines. “At such a time and under such conditions I thought it eminently fitting to show some token of our feeling, and I therefore instructed my subordinate officers to come to the position of ‘salute’ in the manual of arms as each body of the Confederates passed before us. 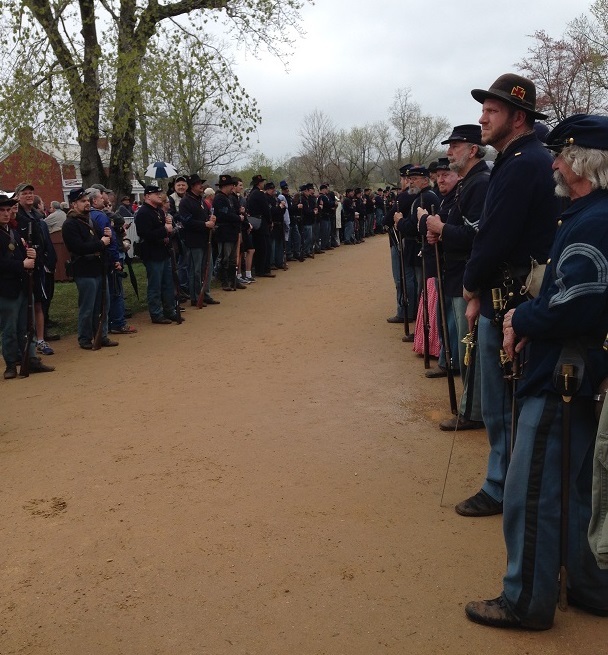 “At a distance of possibly twelve feet from our line, the Confederates halted and turned face towards us. Their lines were formed with the greatest care, with every officer in his appointed position, and thereupon began the formality of surrender. “Bayonets were affixed to muskets, arms stacked, and cartridge boxes unslung and hung upon the stacks. Then, slowly and with a reluctance that was appealingly pathetic, the torn and tattered battleflags were either leaned against the stacks or laid upon the ground. “The emotion of the conquered soldiery was really sad to witness. Some of the men who had carried and followed those ragged standards through the four long years of strife, rushed, regardless of all discipline, from the ranks, bent about their old flags, and pressed them to their lips with burning tears. Gallery | This entry was posted in Virginia and tagged Appomattox150, Lawrence Joshua Chamberlain, staking of the arms. Bookmark the permalink. What a moving account of the surrender. I love Joshua Chamberlain’s writings. He was a philosophy profession, which you can kind of tell by his writing style.